If asked what the heartbeat of your home is, most people would readily reply the dining room. The dining room is where you gather for intimate family meals. It’s the room where you entertain guests and have epic game nights. It’s where the children do their homework as they have an afternoon snack after school. Simply put, it’s the room that feels most like home. However, as the heartbeat of your home, it’s also a room that’s bustling with activity. It’s also the room that has the highest potential for spills. Whether it’s food or drink, your dining room floor should be easy to clean and resistant to damage. 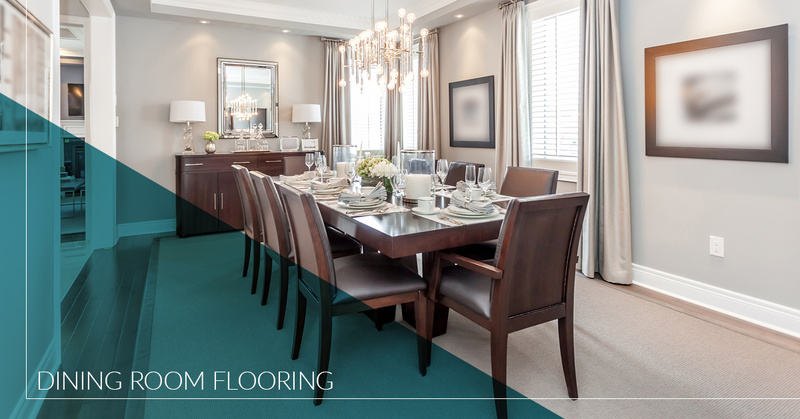 Dining room flooring should also fit the decor of your home to help create the atmosphere you are looking for. Whether you are going for a traditional or modern look, your flooring choice should serve that end. At Shelby Design Center, our flooring showroom carries a wide range of flooring types and options. Whether you want a beautiful, sturdy hardwood floor or a budget-friendly laminate option, we’ve got you covered. What Type of Flooring is Right for My Dining Room? 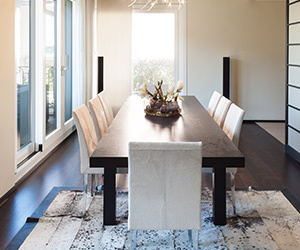 While you have a nearly endless amount of options for flooring, here are some of the most popular types of flooring for dining rooms. Hardwood flooring can help you create a traditional, elegant look that’s hard to beat. And when properly taken care of, it can last you many years. You can refinish hardwood flooring up to 10 times before you need to replace it! If you opt for hardwood flooring in your dining room, be sure to add a protective finish that helps it stand up to scuffs and spills. Laminate flooring is great if you’re on a tight budget. However, just because it’s affordable doesn’t mean it can’t deliver on aesthetics. On top of that it’s stain-resistant, scratch-resistant, and easy to clean, making it a great dining room floor option! At Shelby Design Center, our luxury vinyl planks are beautiful and functional. Modern vinyl flooring design makes it look a lot closer to the material it’s trying to imitate, down to the patterns and textures. Whether you want to mimic the look of hardwood or slate, we’ve got an array of options to make sure we can meet any design preference. When you choose Shelby Design Center for your dining room flooring, you know you are in good hands. Our expert flooring design consultants can help you wade through all the options: we’ll discuss your budget, personal preferences, the interior decor style of your home, and even your lighting strategy. With over 20,000 feet of lighting and flooring showroom, our flooring store is stocked to meet your needs. Over our 20 years of serving Shelby Township, we’ve helped thousands of our neighbors create the dining room of their dreams. Fill out our online contact form to schedule an appointment for a dining room flooring consultation today. We look forward to meeting with you.